A scarce view of Genoa naming some 56 important locations. 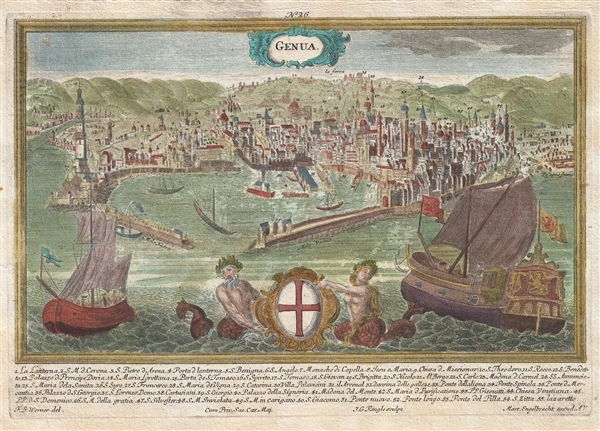 A scarce c. 1725-1750 panoramic view of Genoa, Italy by Martin Engelbrecht. This view follows the work of Jeremias Wolff who produced a large format view of Genoa earlier. Engelbrecht presents us with a busy harbor, with merchant ships coming and going. In the city itself he identifies some 55 specific buildings. This view was drawn by Martin Englebrecht and published in Augsburg by Friederich Bernhard Werner. Martin Engelbrecht (1684-1756) and his brother Christian were artists, print sellers, and engravers based in Augsburg, Germany, during the first half of the 18th Century. The Engelbrecht firm was established in 1717 and produced more than 5,000 printed. Among their work are city views issued by Friedrich Bernhard Werner and others. The duo are better known for creating miniature diorama cards which, inserted into a display box offered religious scenes from a three dimensional perspective. They are the only engravers to have been granted a royal permission to produce such scenes – which at the time seemed magical. They also produced portraits of monarchs and other local dignitaries. The work of the Engelbrecht brothers has been called "beyond compare." The Engelbrecht firm launched the careers of several other artists, including Jeremias Wachsmuht and Johann David Nessenthaler. Friedrich Bernhard Werner (1690-1778) was a German-born civil engineer, trained in Nice, who went on to become an accomplished copper-plate engraver, interested in subjects of cityscapes, monuments, churches, and public works. During the mid-18th century Werner travelled extensively in Central Europe documenting the architecture of its most prominent cities. Good. Blank on verso. Marginal soiling.